concept and layout for on female artists and architects in L.A.
‘L.A. Women’ gathers work and studio portraits of an extensive selection of artists and architects who live and work in L.A. It is the fruit of a six-month period spent in the city by Viennese artist and photographer Eva Schlegel. She did research, dialoguing and photographing on-site in the studios and offices. The artists are all international, from a grande dame like conceptual artist Mary Kelly to Laura Owens and Liz Larner. The architects are of similar importance in their field. Generously illustrated with color photographs, L.A. Women provides a personal view of a milieu not commonly seen but crucially important to understanding the context of American cultural production today. A large appendix on each artist and architect contains biographical material and an exhaustive list of exhibitions and projects. 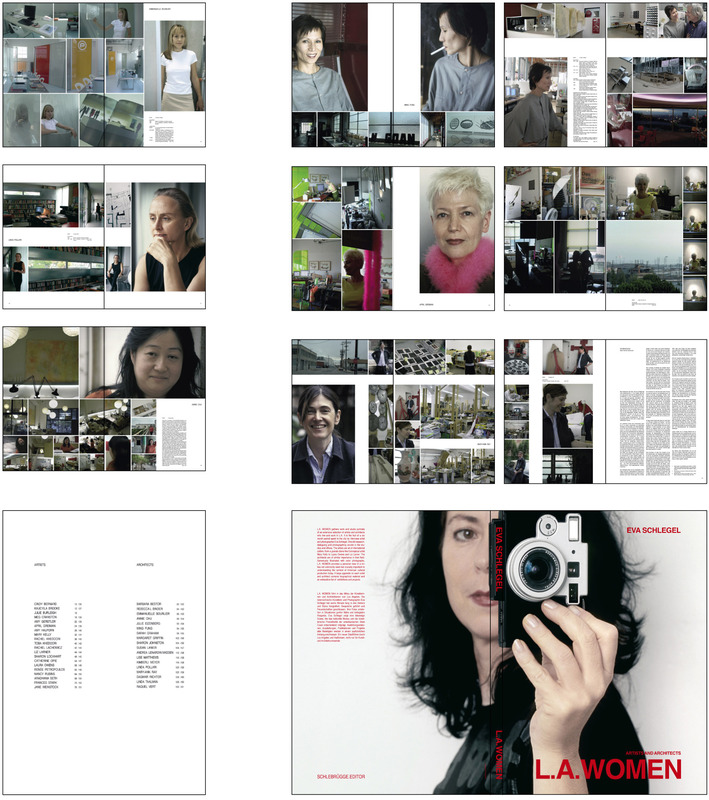 The artists an architects coverd in the book: Cindy Bernard, Kaucyila Brooke, Julie Burleigh, Meg Cranston, Amy Gerstler, April Greiman, Amy Halpern, Mary Kelly, Rachel Khedoori, Toba Khedoori, Rachel Lachowicz, Liz Larner, Sharon Lockhart, Catherine Opie, Laura Owens, Renée Petropoulos, Nancy Rubins, Aradhana Seth, Frances Stark, Jane Weinstock, Barbara Bestor, Rebecca L. Binder, Emmanuelle Bourlier, Annie Chu, Julie Eizenberg, Ming Fung, Sarah Graham, Margaret Griffin, Sharon Johnston, Susan Lanier, Andrea Lenardin Madden, Lise Matthews, Kimberli Meyer, Linda Pollari, Mary-Ann Ray, Dagmar Richter, Linda Taalman, Raquel Vert.